I just realized this coat is 100% British! (except for its maker, of course). I bought the wool-mohair-alpaca-nylon mix in the fabric shop nearby, and the silk lining with Melissa and Anwen; the self-cover buttons and shoulder pads came from sewessential.co.uk, who ship super fast – I received my package the day after I ordered. The lining is white with silver arabesques. I’ll take a close-up shot later. Melissa, you’re damn right – silk-lined pockets are such a tactile treat for a fabric lover. 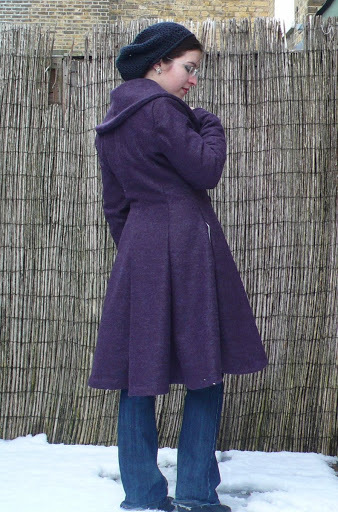 I don’t have much to say about the pattern, really – except that Vogue 8346 was exactly the design I was after: a classic winter coat with princess seams. The instructions were great. This pattern is a winner. For reference, I made view D, but cut the hem at view B to have the same length as pictured in view D, because I’m so short. I cut the front pieces in a size 10 and the back pieces in a size 8; I wanted the ability to wear the coat with 3 layers underneath (including a thick jumper, as in these pictures), so I made it a bit larger than usual. The overall construction went fast, but the hand finishing (snaps, buttons, sleeves, and one very long hem) took forever! I’m so glad I’m done; I have a feeling this coat will be worn to death. I love how swishy the skirt is, and this is really helped by the lining. The coat didn’t feel half as full-skirted when I only tried the shell on. I’ll post more details later (lining, buttons, etc.). Whenever I feel like taking more pictures. Next up on my sewing list are: a few knit tops, a sofa cover, and a laptop case for Seb. OMG that coat is a masterpiece! The skirt falls beautifully on you and the lining was the perfect choice! Your restraint at Goldhawk Road truly paid off, I love it!! Well done!, as the Brits say. Lovely coat and perfect for the chilly weather. WOW! It’s Beautiful!! Love the hat too!! Dear Isabelle, what can I say. That coat is gorgeous and looks so warm. You got it done just in time for our cold spell. Quel beau manteau!! Tu es vraiment très douée, Isabelle, bravo!! Voilà longtemps que je ne venais pas. Toujours aussi ravissante, ton manteau est superbe !